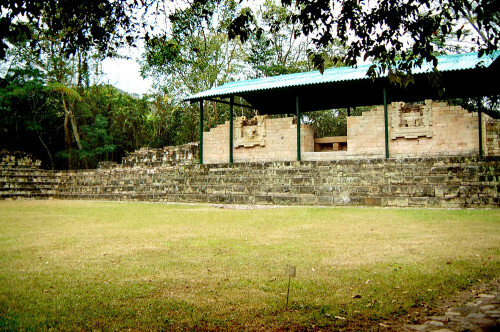 Structure 67 – Plaza BLas Sepulturas is a residential complex just outside of Copan. 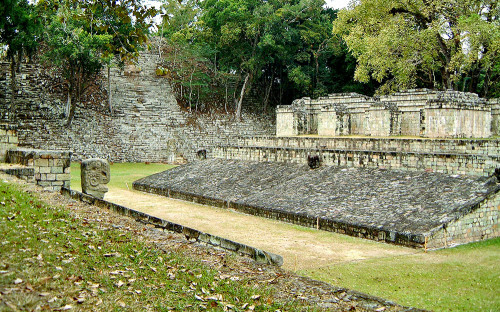 With over 100 expensive stone compounds and 40 private plazas, the settlement of Las Sepulturas was clearly home to many wealthy and important families of Copan, but exactly who they were or why they were so wealthy is unknown. 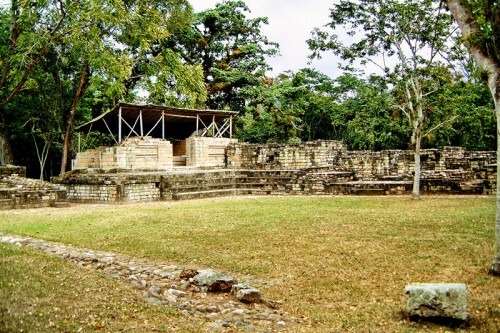 Despite its grandeur, it appears Las Sepulturas was not the home of the Royal Family of Copan, as they resided in Group 3, just to the south of the Main Acropolis at the main site. W1110: Ball-court at CopanExcavations have revealed that Las Sepulturas was home to many of the craftsmen used by the Copan royalty; with shell, needles, awls and drills being found. Around Plaza A, the remains of the attire and paraphernalia of the sacred ball-game have been found in abundance. The game had to be played by warriors of virtue as the winners chosen by the Gods based on their piety rather than their skill. As such, the game was often used to settle political disputes, which may explain the absence of war at Copan. The argument that Plaza A was home to a religious elite is well supported. 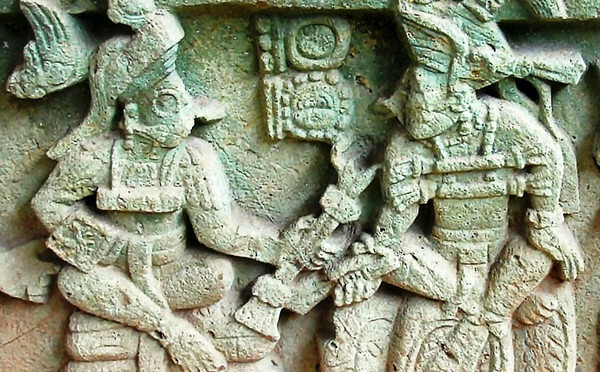 Firstly, another ancient burial was found with Plaza A that belonged to a High Priest or Shaman who was buried in c.450AD – only a short time after Copan was founded. There are very few burials within Plaza A and no females have been found, unlike in the surrounding plazas, suggesting it was a place reserved for dignitaries. The buildings are grander and also larger within Plaza A and there is no communal kitchen. 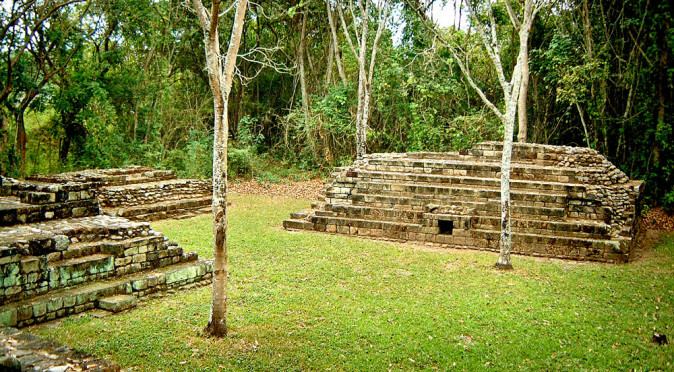 Plaza A is also home to the House of the Bacab, which appears to be a Temple structure (read more). W1129: Structure 82Stucture 9N-82 (House of the Ba’kab), and in particular the the carved bench discovered by archaeologists David Webster and Elliot Abrams in 1980, has brought about some revolutionary insights into the importance of Las Sepulturas. The outside of the building is very stately and is decorated with statues of the Pauahtun, known as the God of Scribes, which is where it gets the name “The House of The Scribes” (fig W1129). Inside is beautifully carved bench which features a lengthy hieroglyphic text and is capped with a scene of the creation. 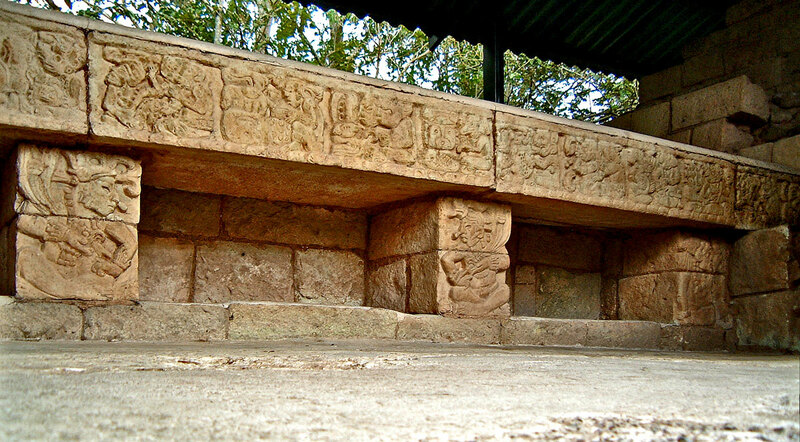 The bench features six pillars, each carved with an image of a Ba’kab supporting the bench as though supporting the earth or the cosmos – which is their role within Maya Religion. Deciphering the text which runs along the bench is work in progress, but it seems to indicate that the building was built and consecrated in 781AD by Mak-Chanal, who was the successor of lord Ko-Xop and Keeper of the Sacred Texts. 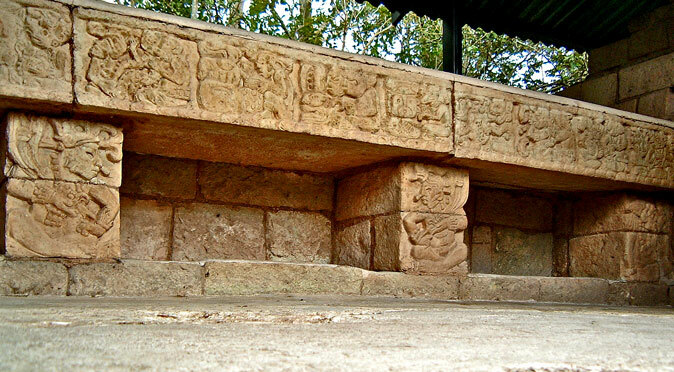 The magnificent building and its regal carved bench have led many to believe it demonstrates that Las Sepulturas was starting to split from Copan. This is supported by the text which states that Mak-Chanal is consecrating the building, a role which should have been undertaken by the Holy Lord of Copan, Yax Pasaaj. 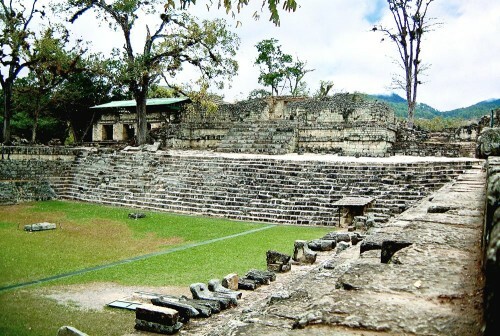 There is evidence at Copan that the latter rulers were struggling to maintain a grip on the throne and the royal line did cease to hold power following the death of Yax Pasaaj some 40 years after this event. Many cite the bizarre execution of Copan’s 13th Ruler, 18 Rabbit, at the hands of his vassal, the Quiriguan ruler Cauac Sky, as the beginning of this dissolution of power. But it seems to have started prior to this according to 18 Rabbit’s monumental history, the Hieroglyphic Stairway on Temple 26. Here 18 Rabbit states that his father, the 12th Ruler, Smoke Imix, ascended to the throne as an heir of the Quiriguan lineage rather than that of Copan’s divine founder, K’inich Yax K’uk’ Mo’ (click here to read more on this). W1082: East Court with the Popol Nah far left Following 18 Rabbit’s demise and Quirigua’s independence, it appears that Copan’s subsequent rulers tried to appease the regional lords by creating a “Council of Nine”, which presumably would have included the lord of Las Sepulturas. 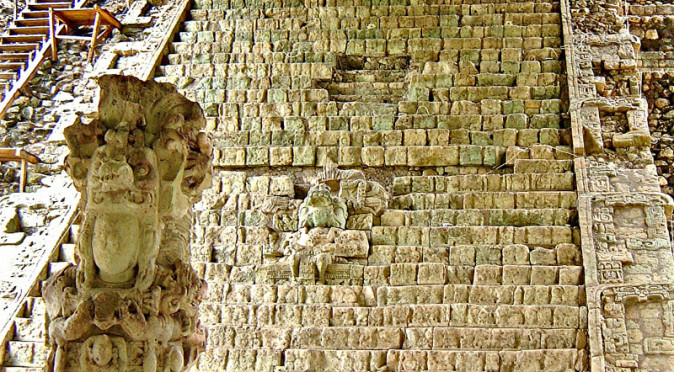 The lords who met at the Popol Nah, or Community House, which was built at the heart of Copan’s ceremonial centre in the East Court (fig W1082). This is believed to represent a “desperate” attempt to appease the fractious regional lords and prevent them from also striking for independence. W1064QSF: Altar Q – Scene OneIn 763AD, Yax Pasaj also came to the throne under curious circumstances, as his mother appears to have been a Palanque noblewoman and his father is not listed as Smoke Shell, the 15th Ruler. 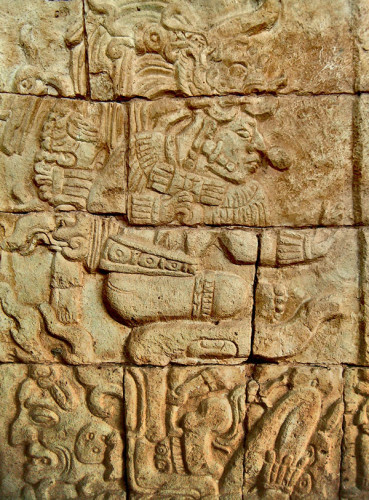 Like 18 Rabbit, he built monuments to demonstrate his right to the throne, most notably Altar Q (fig W1064QSF) where he is pictured receiving the divine sceptre of kingship directly from K’inich Yax K’uk’ Mo’ having travelled to the underworld (read more on this in the article “Temple 11: Portal to the Underworld“). 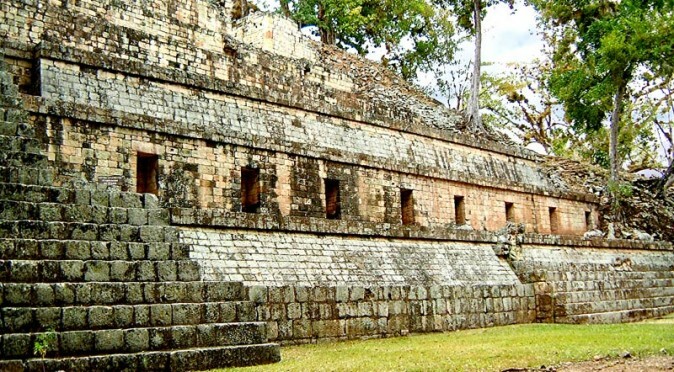 So there is plenty of evidence that the Royal Line at Copan was suffering difficulties which culminated in the cessation of the Royal Line after Yax Pasaaj’s death. W1126: Bench End PanelHowever, the text on the bench at Las Sepulturas ends by naming Yax Pasaaj and infers that Mak-Chanal was subservient to him, as His Keeper of the Sacred Books. 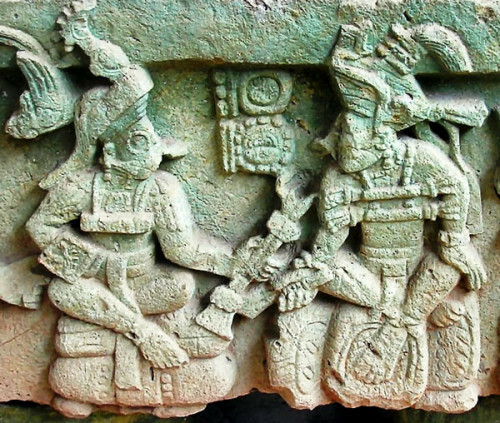 Furthermore, the end panel on the bench shows Yax Pasaaj carrying the sceptre of divine kingship and summoning the Pauahtun to raise the earth and sky, demonstrating that bench and the building were in honour of the divine king of Copan, the creator of the world (fig W1126). Taking Las Sepulturas’ long history into account, and the evidence of religious activity throughout Copan’s dominance, it seems most likely that Las Sepulturas was home to a divine king or high priest prior to Copan’s founding, and that this divine lineage was given the title “Keeper of Sacred Texts” and a percentage of Copan’s profits in order to make way for the divine lineage of Copan. The settlement of Las Sepulturas was therefore probably home to the families of this former royal lineage. Set behind Las Sepulturas' most prominent building, Structure 9N-82, is the diminutive looking Plaza G which may have been a sanctuary for medical and spiritual healing.